Rub your hair on a balloon or wool sweater. What happens to your hair? Try to stick the balloon to the wall. Does it stick? Rub a plastic pen on the wool sweater and hold it near a stream of water. What do you observe? 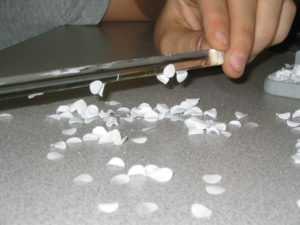 Rub the pen on the sweater again and try to pick up small pieces of paper. In all of these experiments, we are manually moving electrons from one material to another. 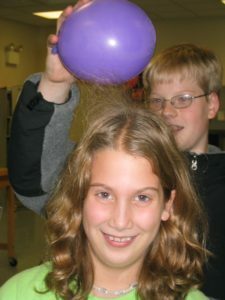 Your hair stands up because it is full of electrons. The electrons don’t like each other and are trying to get as far away from each other as possible. 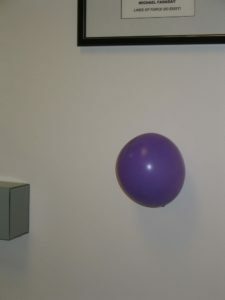 The balloon sticks to the wall because it creates an induced charge. 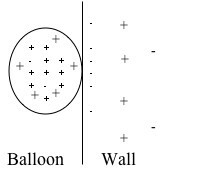 The positive charge of the balloon attracts electrons from the wall and the balloon sticks! The same thing happens with the pen and the water and the pen and the paper.